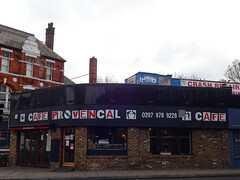 Cafe and restaurant in Herne Hill. Weekends are very busy, with booking recommended. It's smaller inside than it looks from outside, seating only about 40 people at a combination of tall and regular-height tables. The furniture is wooden and mismatched, the floor is varnished boards, and walls are painted a soothing sage green (with the sole exception of an exposed-brick feature wall at the back). Bec has been a regular visitor, once for burger night and several times for brunch. On a burger night, I had the vegetarian Sloppy Joe (hot lentils, cheese, little gem lettuce and salsa) without cheese — most of the vegetarian mains can be made vegan by omission. The burger was quite difficult to eat, the brioche bun lacking structural integrity causing the contents to slide out, so it became more of a fork and knife effort, but worth it — flavoursome and filling, served with crispy, hot chips. On another visit, Bec's full veggie/vegan — eggs poached or scrambled, substituted with spinach for vegan, portobello mushrooms, roasted peppers, fresh grilled tomatoes and avocado with toast (£8.75) was good and a generous portion, although no substitutions were offered. On a November 2017 visit, Bec had crushed avocado, listed on the menu as served with eggs, walnuts & chilli oil (£7.45). I substituted beans which were served in a ramekin, piping hot. The chili oil was just enough to add a spikey bite, liberally sprinkled with crushed walnuts; this added a depth and crunch, and was very good. Steve had banana pancakes with streaky bacon and maple syrup (£7), served with creme fraiche — this was good though the pancakes were rather small and the creme fraiche seemed unnecessary. Cappuccinos (£2.50) were served in mismatched, vintage cups, rather small, with plenty of froth and chocolate dusting. When Kake visited on a Friday morning in August 2018, there were quite a few other customers around 10:30am, split between those chatting over tea in twos and threes, and those working away individually on laptops. Music was playing, relatively interesting, not too loud. A pot of lemon and ginger tea (£2.50) was good quality and generously sized. They have WiFi — ask staff for the password — and at least one set of plug sockets. Bec's verdict: Good quality food in a relaxed, cosy environment with exceptionally friendly staff, and a firm favourite. Child-friendliness: They have at least five IKEA Antilop highchairs (without trays). There's a fold-down baby change table in the narrow space outside the toilet. On our August 2018 visit there was a school-age child in. Accessibility: A steepish ramp to get in. No steps to the toilet, but the cubicle is extremely small, to the point where taller people might have trouble fitting their knees in. Last visited by Kake, August 2018. Opening hours taken from the Cafe Provencal website, March 2018. Last edited 2018-08-20 13:50:01 (version 7; diff). List all versions. Page last edited 2018-08-20 13:50:01 (version 7).